Select a model below to view specials. All include $0 BMW Maintenance! Stock#18722. VIN: D09439. $299/mo plus tax for 36 months, $3,647 down plus drive-off due at delivery plus rebates. Owner loyalty rebates must have BMW F/S owner loyalty. Offer ends January 31, 2018. Important info. 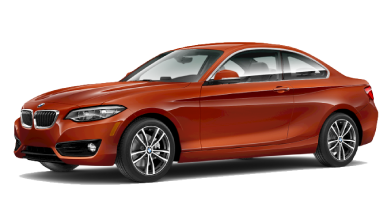 2017 BMW M240i Convertible – BRAND NEW! Stock#171840. VIN: 666823. $349/mo plus tax for 36 months, $5,645 down plus drive-off due at delivery plus rebates. Owner loyalty rebates must have BMW F/S owner loyalty. Offer ends January 31, 2018. Important info. Stock#18564. VIN: C07345. $399/mo plus tax for 36 months, $4,680 down plus drive-off due at delivery plus rebates. Owner loyalty rebates must have BMW F/S owner loyalty. Offer ends January 31, 2018. Important info. 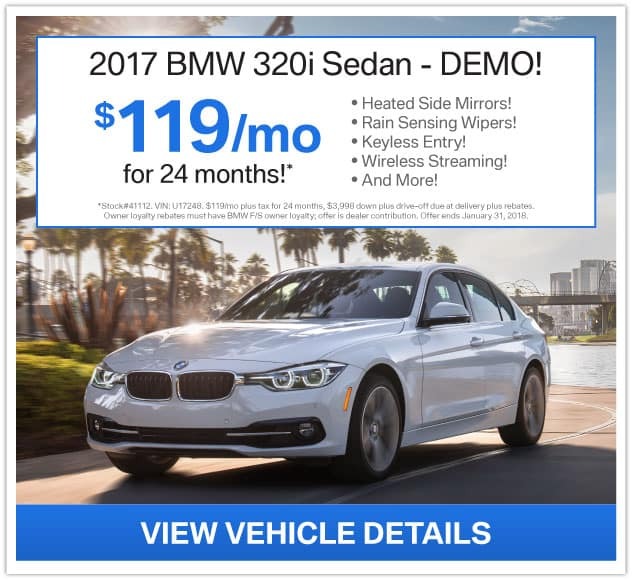 2017 BMW 320i Sedan – DEMO! Stock#41112. VIN: U17248. $119/mo plus tax for 24 months, $3,998 down plus drive-off due at delivery plus rebates. Owner loyalty rebates must have BMW F/S owner loyalty; offer is dealer contribution. Offer ends January 31, 2018. Important info. 2017 BMW 330i Sedan – DEMO! Stock#41080. VIN: U55114. $129/mo plus tax for 24 months, $4,597 down plus drive-off due at delivery plus rebates. Owner loyalty rebates must have BMW F/S owner loyalty; offer is dealer contribution. Offer ends January 31, 2018. Important info. Stock#41082. VIN: U55521. $139/mo plus tax for 24 months, $4,998 down plus drive-off due at delivery plus rebates. Owner loyalty rebates must have BMW F/S owner loyalty; offer is dealer contribution. Offer ends January 31, 2018. Important info. Stock#41099. VIN: U55510. $149/mo plus tax for 24 months, $4,998 down plus drive-off due at delivery plus rebates. Owner loyalty rebates must have BMW F/S owner loyalty; offer is dealer contribution. Offer ends January 31, 2018. Important info. Stock#41104. VIN: U55518. $149/mo plus tax for 24 months, $4,998 down plus drive-off due at delivery plus rebates. Owner loyalty rebates must have BMW F/S owner loyalty; offer is dealer contribution. Offer ends January 31, 2018. Important info. Stock#41083. VIN: U55825. $149/mo plus tax for 24 months, $5,998 down plus drive-off due at delivery plus rebates. Owner loyalty rebates must have BMW F/S owner loyalty; offer is dealer contribution. Offer ends January 31, 2018. Important info. Stock#41092. VIN: U56303. $149/mo plus tax for 24 months, $4,998 down plus drive-off due at delivery plus rebates. Owner loyalty rebates must have BMW F/S owner loyalty; offer is dealer contribution. Offer ends January 31, 2018. Important info. • Check back soon for features! Stock#41098. VIN: U55531. $159/mo plus tax for 24 months, $4,998 down plus drive-off due at delivery plus rebates. 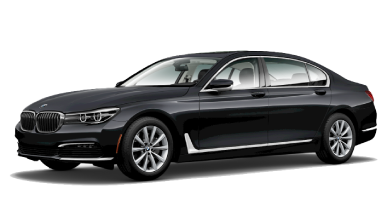 Owner loyalty rebates must have BMW F/S owner loyalty; offer is dealer contribution. Offer ends January 31, 2018. Important info. Stock#41093. VIN: U55520. $159/mo plus tax for 24 months, $4,998 down plus drive-off due at delivery plus rebates. Owner loyalty rebates must have BMW F/S owner loyalty; offer is dealer contribution. Offer ends January 31, 2018. Important info. Stock#41120. VIN: U55866. $159/mo plus tax for 24 months, $4,998 down plus drive-off due at delivery plus rebates. Owner loyalty rebates must have BMW F/S owner loyalty; offer is dealer contribution. Offer ends January 31, 2018. Important info. 2017 BMW 330i xDrive Sedan – DEMO! Stock#41089. VIN: A023417. $159/mo plus tax for 24 months, $5,998 down plus drive-off due at delivery plus rebates. Owner loyalty rebates must have BMW F/S owner loyalty; offer is dealer contribution. Offer ends January 31, 2018. Important info. Stock#41114. VIN: U54346. $159/mo plus tax for 24 months, $5,998 down plus drive-off due at delivery plus rebates. 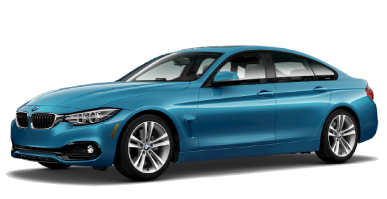 Owner loyalty rebates must have BMW F/S owner loyalty; offer is dealer contribution. Offer ends January 31, 2018. Important info. Stock#41078. VIN: U52014. $159/mo plus tax for 24 months, $5,998 down plus drive-off due at delivery plus rebates. Owner loyalty rebates must have BMW F/S owner loyalty; offer is dealer contribution. Offer ends January 31, 2018. Important info. Stock#41079. VIN: U55305. $169/mo plus tax for 24 months, $5,998 down plus drive-off due at delivery plus rebates. Owner loyalty rebates must have BMW F/S owner loyalty; offer is dealer contribution. Offer ends January 31, 2018. Important info. Stock#41097. VIN: U55275. $179/mo plus tax for 24 months, $5,998 down plus drive-off due at delivery plus rebates. Owner loyalty rebates must have BMW F/S owner loyalty; offer is dealer contribution. Offer ends January 31, 2018. Important info. Stock#41081. VIN: U55303. $179/mo plus tax for 24 months, $5,998 down plus drive-off due at delivery plus rebates. 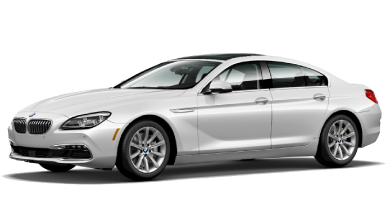 Owner loyalty rebates must have BMW F/S owner loyalty; offer is dealer contribution. Offer ends January 31, 2018. Important info. • Active Blind Spot Detection! Stock#18521. VIN: U90169. $199/mo plus tax for 36 months, $4,036 down plus drive-off due at delivery plus rebates. Owner loyalty rebates must have BMW F/S owner loyalty; offer is dealer contribution. Offer ends January 31, 2018. Important info. 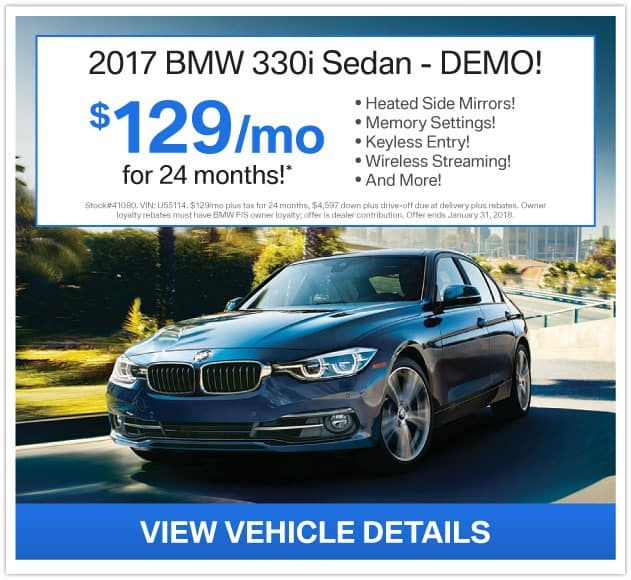 2018 BMW 330i Sedan – DEMO! Stock#41094. VIN: 886380. $199/mo plus tax for 24 months, $5,998 down plus drive-off due at delivery plus rebates. Owner loyalty rebates must have BMW F/S owner loyalty; offer is dealer contribution. Offer ends January 31, 2018. Important info. Stock#18533. VIN: T89846. $199/mo plus tax for 24 months, $4,200 down plus drive-off due at delivery plus rebates. Owner loyalty rebates must have BMW F/S owner loyalty. Offer ends January 31, 2018. Important info. Stock#41091. VIN: U55632. $199/mo plus tax for 24 months, $5,998 down plus drive-off due at delivery plus rebates. Owner loyalty rebates must have BMW F/S owner loyalty; offer is dealer contribution. Offer ends January 31, 2018. Important info. 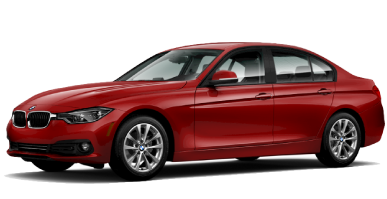 2017 BMW 328d Sedan – BRAND NEW! Stock#171743. VIN: 389128. $229/mo plus tax for 24 months, $4,811 down plus drive-off due at delivery plus rebates. Owner loyalty rebates must have BMW F/S owner loyalty. Offer ends January 31, 2018. Important info. 2017 BMW 330i xDrive Sports Wagon – DEMO! • 1st & 2nd Row Sunroof! Stock#41018. VIN: 023730. $239/mo plus tax for 24 months, $5,998 down plus drive-off due at delivery plus rebates. Owner loyalty rebates must have BMW F/S owner loyalty; offer is dealer contribution. Offer ends January 31, 2018. Important info. 2018 BMW 330i xDrive Sports Wagon – DEMO! Stock#41069. VIN: 023918. $279/mo plus tax for 24 months, $5,998 down plus drive-off due at delivery plus rebates. Owner loyalty rebates must have BMW F/S owner loyalty; offer is dealer contribution. Offer ends January 31, 2018. Important info. Stock#18624. VIN: 369750. $279/mo plus tax for 36 months, $4,986 down plus drive-off due at delivery plus rebates. Owner loyalty rebates must have BMW F/S owner loyalty. Offer ends January 31, 2018. Important info. Stock#18699. VIN: V00812. $299/mo plus tax for 36 months, $4,995 down plus drive-off due at delivery plus rebates. Owner loyalty rebates must have BMW F/S owner loyalty. Offer ends January 31, 2018. Important info. 2018 BMW 430i Gran Coupe Sedan – DEMO! Stock#40858. VIN: G75599. $239/mo plus tax for 24 months, $5,998 down plus drive-off due at delivery plus rebates. Owner loyalty rebates must have BMW F/S owner loyalty; offer is dealer contribution. Offer ends January 31, 2018. Important info. Stock#40871. VIN: G77078. $249/mo plus tax for 24 months, $5,998 down plus drive-off due at delivery plus rebates. Owner loyalty rebates must have BMW F/S owner loyalty; offer is dealer contribution. Offer ends January 31, 2018. Important info. 2018 BMW 430i Gran Coupe Sedan – BRAND NEW! Stock#18339. VIN: G79509. $299/mo plus tax for 36 months, $4,477 down plus drive-off due at delivery plus rebates. Owner loyalty rebates must have BMW F/S owner loyalty. Offer ends January 31, 2018. Important info. Stock#41113. VIN: G77738. $339/mo plus tax for 36 months, $5,998 down plus drive-off due at delivery plus rebates. 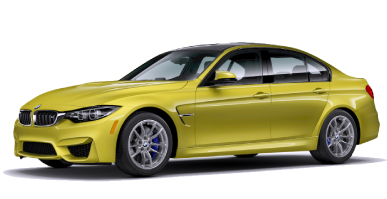 Owner loyalty rebates must have BMW F/S owner loyalty; offer is dealer contribution. Offer ends January 31, 2018. Important info. 2018 BMW 430i Convertible – BRAND NEW! • Burl Walnut Wood Trim! Stock#18216. VIN: C72442. $399/mo plus tax for 36 months, $5,474 down plus drive-off due at delivery plus rebates. Owner loyalty rebates must have BMW F/S owner loyalty. Offer ends January 31, 2018. Important info. 2018 BMW 440i Gran Coupe Sedan – BRAND NEW! Stock#18119. VIN: F06908. $399/mo plus tax for 36 months, $5,564 down plus drive-off due at delivery plus rebates. Owner loyalty rebates must have BMW F/S owner loyalty. Offer ends January 31, 2018. Important info. Stock#18662. VIN: A37524. $349/mo plus tax for 36 months, $5,400 down plus drive-off due at delivery plus rebates. Owner loyalty rebates must have BMW F/S owner loyalty. Offer ends January 31, 2018. Important info. 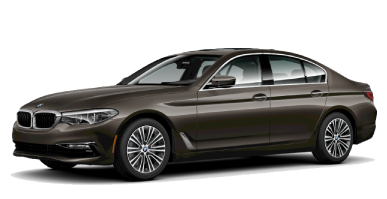 2018 BMW 540i xDrive – DEMO! Stock#41090. VIN: G891217. $459/mo plus tax for 24 months, $8,998 down plus drive-off due at delivery plus rebates. Owner loyalty rebates must have BMW F/S owner loyalty; offer is dealer contribution. Offer ends January 31, 2018. Important info. Check back soon for 6 Series offers! Check back soon for 7 Series offers! 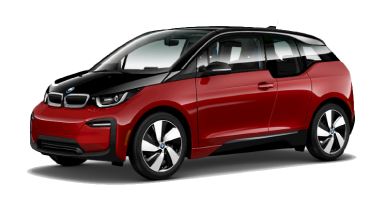 2017 BMW i3 Range Extender – BRAND NEW! Stock#172055. VIN: 895094. $99/mo plus tax for 24 months, $3,995 down plus drive-off due at delivery plus rebates. Owner loyalty rebates must have BMW F/S owner loyalty. Offer ends January 31, 2018. Important info. Check back soon for M Model offers! 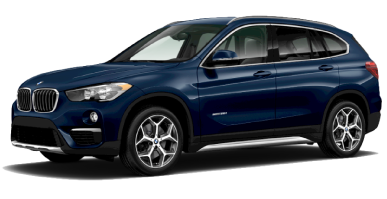 2018 BMW X1 xDrive28i – DEMO! Stock#41111. VIN: F89328. $189/mo plus tax for 24 months, $4,998 down plus drive-off due at delivery plus rebates. Owner loyalty rebates must have BMW F/S owner loyalty; offer is dealer contribution. Offer ends January 31, 2018. Important info. Stock#18387. VIN: F93235. $229/mo plus tax for 36 months, $3,966 down plus drive-off due at delivery plus rebates. Owner loyalty rebates must have BMW F/S owner loyalty. Offer ends January 31, 2018. Important info. Stock#18428. VIN: K20793. $229/mo plus tax for 36 months, $3,966 down plus drive-off due at delivery plus rebates. Owner loyalty rebates must have BMW F/S owner loyalty. Offer ends January 31, 2018. Important info. Stock#18758. VIN: K22848. $229/mo plus tax for 36 months, $3,966 down plus drive-off due at delivery plus rebates. Owner loyalty rebates must have BMW F/S owner loyalty. Offer ends January 31, 2018. Important info. Stock#18596. VIN: C75126. $348/mo plus tax for 36 months, $4,500 down plus drive-off due at delivery plus rebates. Owner loyalty rebates must have BMW F/S owner loyalty. Offer ends January 31, 2018. Important info. 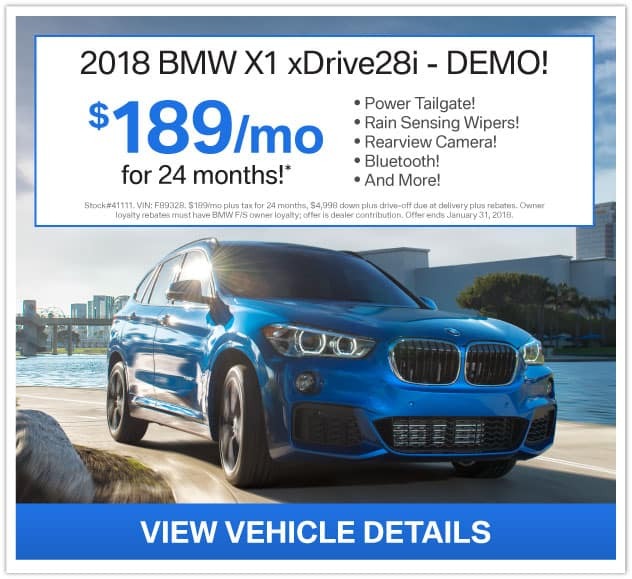 2018 BMW X4 xDrive28i – BRAND NEW! Stock#18169. VIN: T82372. $379/mo plus tax for 36 months, $5,650 down plus drive-off due at delivery plus rebates. Owner loyalty rebates must have BMW F/S owner loyalty. Offer ends January 31, 2018. Important info. 2018 BMW X5 xDrive35i – BRAND NEW! Stock#18634. VIN: X95085. $449/mo plus tax for 36 months, $6,150 down plus drive-off due at delivery plus rebates. Owner loyalty rebates must have BMW F/S owner loyalty. Offer ends January 31, 2018. Important info. 2018 BMW X5 xDrive40e iPerformance – BRAND NEW! Stock#18370. VIN: V99002. $459/mo plus tax for 36 months, $6,900 down plus drive-off due at delivery plus rebates. Owner loyalty rebates must have BMW F/S owner loyalty. Offer ends January 31, 2018. Important info. 2017 BMW X6 xDrive35i – BRAND NEW! • Driving Assistance Plus Pkg! Stock#171563. VIN: X47649. $659/mo plus tax for 24 months, $7,595 down plus drive-off due at delivery plus rebates. Owner loyalty rebates must have BMW F/S owner loyalty. Offer ends January 31, 2018. Important info.